Vietnam’s commercial capital and largest city, Ho Chi Minh City (or Saigon, as it’s known to most locals) is divided into 24 districts and has a population of more than eight million. Despite its large population, Ho Chi Minh City’s centre is dense and compact, making it easy to stay close to the action. As a visitor to Ho Chi Minh City, you’ll want to stay either in District 1, which is where you’ll find almost all of the city’s cultural, historical and commercial attractions, or in District 3, which is a cheaper, more “local” district close to the city centre. Within District 1, you’ll find several different areas, each of which offers a different experience for people visiting Ho Chi Minh City. We’ve listed all of the best areas to stay in Saigon below, along with our top hotel recommendations for each neighbourhood. 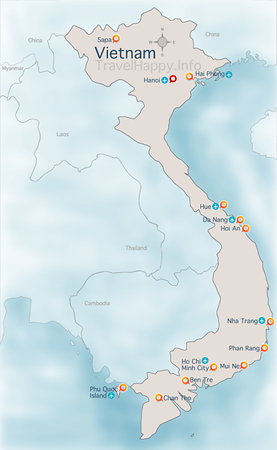 As of 2017, Ho Chi Minh City does not have any mass transit system, although one is under construction. This means you’ll need to rely on taxis or motorcycle taxi to make your way around the city. District 1 of Ho Chi Minh City is fairly compact, meaning you can walk between most of the areas listed below in 10-15 minutes. 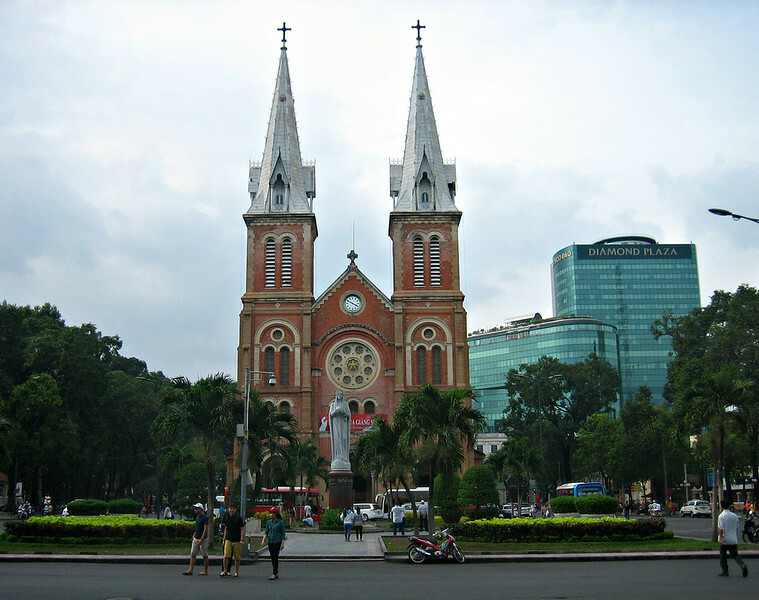 Nguyen Hue and Dong Khoi are Ho Chi Minh City’s two major commercial streets and home to most of the city’s high-end hotels. Pham Ngu Lao and Bui Vien are Ho Chi Minh City’s equivalent of Khao San Road and where you’ll find most of the city’s budget accommodation. Because Ho Chi Minh City’s central area is quite dense and compact, the area you stay in doesn’t have as much of an impact on your experience as it would in Bangkok, but it’s still worth choosing an area that matches your tastes. The Nguyen Hue/Dong Khoi area is the heart of District 1. This is where you’ll find Ho Chi Minh City’s newest shopping malls, luxury boutiques and high-end restaurants. It’s also where you’ll see most of the city’s modern highrises, such as the ultra-modern Bitexco Financial Tower. Almost all of Ho Chi Minh City’s luxury hotels are located in this area. 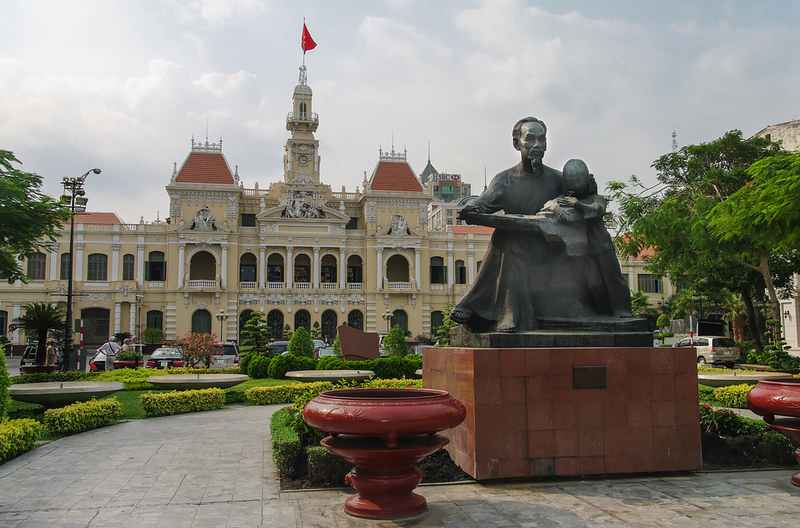 The area around Nguyen Hue in particular is home to a selection of classic luxury hotels built during the French colonial era and made famous during the Vietnam War, such as the Rex, Majestic and Continental. Nguyen Hue and Dong Khoi also have a good selection of modern hotels, from the Park Hyatt to the ultra-luxury Reverie Saigon. If you’re looking for a five star place to stay, this is the area that you’ll want to look in. The Nguyen Hue/Dong Khoi area has a great selection of cafés and restaurants, ranging from Vietnamese food to Western dining and high-end coffee. It’s also a short walk from Ho Chi Minh City’s Japantown area, which offers a good selection of bars and places to eat. Since this is the absolute centre of Saigon, expect to pay slightly higher prices than you would in a more “local” neighbourhood. Arguably Vietnam’s most luxurious hotel, The Reverie Saigon offers opulent rooms with ornate designer furniture and spectacular views over District 1. A perfect choice if you want to indulge and treat yourself while in Ho Chi Minh City. Equally as luxurious as The Reverie but more elegant and understated, the Park Hyatt Saigon offers a great selection of high-end rooms and suites with world class facilities. Saigon’s oldest luxury hotel, the Continental Hotel Saigon has one of the best locations in the city and a great selection of rooms that, although dated by modern standards, offer an exciting trip back in time to the colonial Saigon of the 1920s. This mid-priced serviced apartment building on Le Thanh Ton offers a great selection of rooms with kitchens and cooking equipment, plus one of the best locations in the city for people that want to be close to the Dong Khoi area and Japantown. Located on Hai Ba Trung, this budget hotel is a short distance from Dong Khoi, Nguyen Hue and other major shopping streets. Rooms are clean and simply decorated, offering great value in an area better known for luxury than good deals. 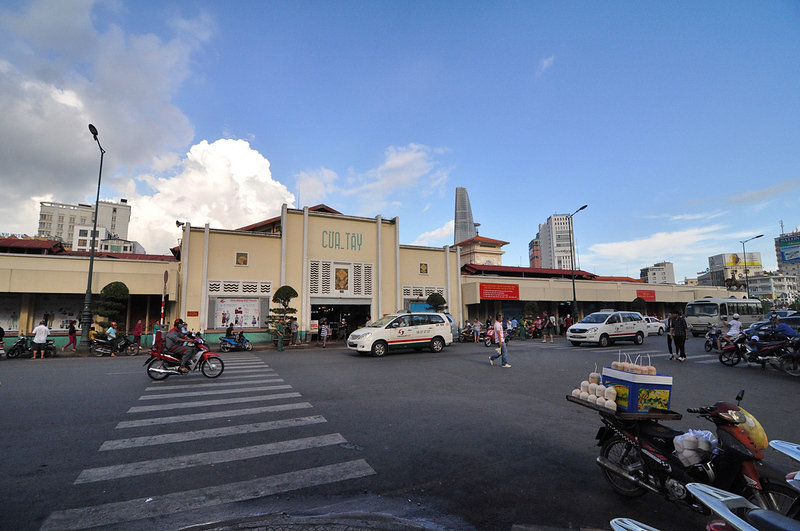 Ben Thanh Market is a major landmark in District 1, and the area around the market is home to a variety of mid-priced hotels. This part of Saigon isn’t as flashy as the Nguyen Hue/Dong Khoi area but offers a unique, if extremely crowded and busy, experience for visitors. If you want to be right in the centre of District 1’s hustle and bustle, the Ben Thanh area is where you’ll want to stay. Note that as of 2017 large parts of this area are closed for construction of the Ho Chi Minh City Metro, making traffic and construction noise potential annoyances. With a great location on Le Thanh Ton Street, the Norfolk Hotel Saigon offers luxurious rooms and great facilities a short walk from the War Remnants Museum and other attractions. Liberty Central Saigon Citypoint is a modern four star hotel located on Pasteur Street, a short walk away from Nguyen Hue, the War Remnants Museum and Ben Thanh Market. With clean and modern rooms, a rooftop pool and a convenient location just minutes from Ben Thanh Market, Grand Silverland Hotel & Spa is a great mid-priced option in the centre of Ho Chi Minh City. Another mid-priced option, A&EM Corner Saigon Hotel has comfortable rooms and a rooftop pool in a great location close to Ben Thanh Market. Cheap, clean and simple, Thien Hai Hotel offers small but comfortable rooms in a great location on Ly Tu Trong Street, close to Ben Thanh Market and a short walk from Nguyen Hue. Another clean and simple budget option, Happy Land Hotel has a great location on Ly Tu Trong Street close to Ben Thanh Market and the centre of District 1. Pham Ngu Lao is Saigon’s backpacker district — a bustling, busy area near the centre of District 1 that offers a great range of cheap hotels and hostels. If you’re visiting Saigon on a budget and want to be close to the backpacker nightlife, this is the place to stay. Pham Ngu Lao Street itself is less of an accommodation hotspot than it once was. 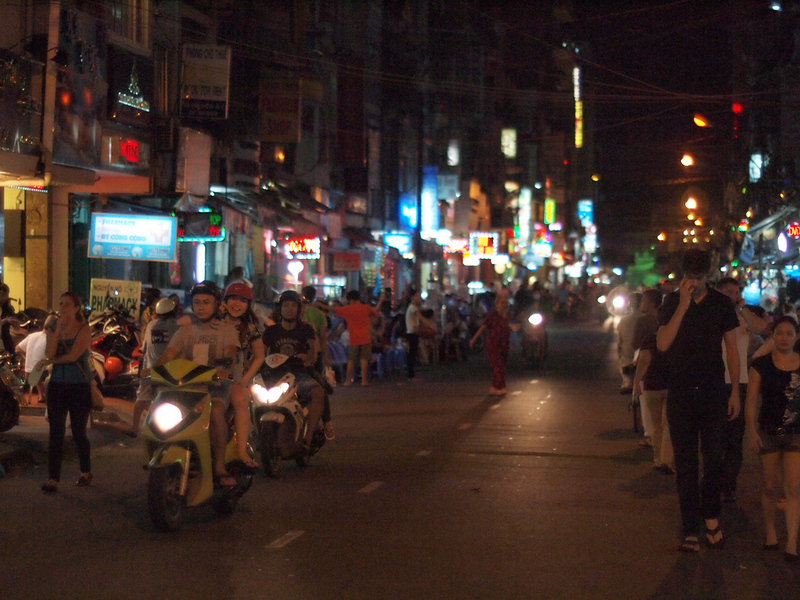 Today, most of the area’s budget hotels and bars can be found on Bui Vien — a short street that acts as Ho Chi Minh City’s equivalent to Khao San Road. This area is busy, exciting and noisy, making it far from ideal if you’re looking for a peaceful and quiet place to stay. However, if you want to be right in the middle of backpacker nightlife, there’s no better area to be in Saigon. The only luxury hotel in the Pham Ngu Lao area, the Pullman Saigon Centre is located on Tran Hung Dao, a short walk away from Pham Ngu Lao and a quick taxi ride into Nguyen Hue, Dong Khoi and other popular shopping streets. Located right on Pham Ngu Lao, Liberty Saigon Greenview is a comfortable three star hotel with clean, modern rooms and a much quieter atmosphere than hotels on nearby Bui Vien. Another three star hotel, Elios Hotel offers modern rooms, a great spa and pleasant views over the District 1 skyline, making it a great option if you’re seeking comfort in Saigon’s backpacker area. This two star hotel on Bui Vien offers great value for money and a convenient location close to nearby restaurants, cafés and bars. While the noise level isn’t zero, it’s more tolerable than in other hotels on Bui Vien. Cheap, simple and comfortable, the rooms in My Hotel are some of the best you’ll find in a low cost hotel near Bui Vien. Located on Tran Hung Dao, this hotel is a short walk away from bars and other nightlife but far enough away to avoid most of the noise. Ho Chi Minh City’s District 3 is close to the centre of Saigon but offers a more local, Vietnamese feel. You’ll find fewer Western restaurants and bars here, with a greater selection of local coffee shops and pho restaurants. Since District 3 has a more local feel and attracts fewer tourists, it’s a great place to find budget accommodation. If you’re on a tight budget and want to avoid the hustle and bustle of Bui Vien, this is a great place to check into a clean, comfortable and affordable hotel or guesthouse. It takes five to 10 minutes to get into District 1 from District 3, meaning you’re never far from the central city. Oakwood Apartments offers modern, spacious serviced apartments in a great location less than 10 minutes from District 1 by taxi. A great choice for long-term visitors. This comfortable three-star hotel on Cach Mang Thang Tam offers modern rooms and facilities that include an outdoor pool and sauna. Located on a quiet lane off Nguyen Dinh Chieu, this family-owned hotel offers clean, simple and comfortable rooms in a convenient location less than 10 minutes from District 1. This friendly local guesthouse on Nguyen Thi Minh Khai is a favourite of backpackers seeking a quieter, more peaceful location than nearby Bui Vien. Rooms are simple, clean and comfortable, with fair pricing that offers great value for money.